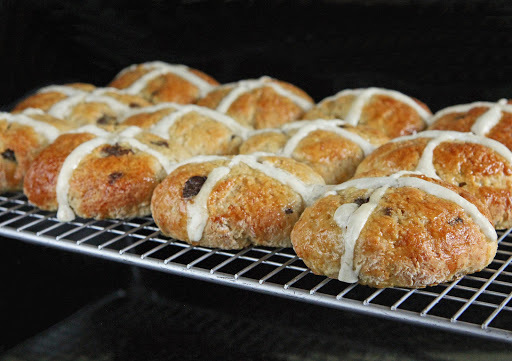 Gluten Free Alchemist: Choc-Cross Buns (gluten free) - ready for Easter! One of the best pleasures of Easter is Hot Cross Buns...... Traditionally made to commemorate the crucifixion of Christ which is marked with Good Friday in the Christian calendar. 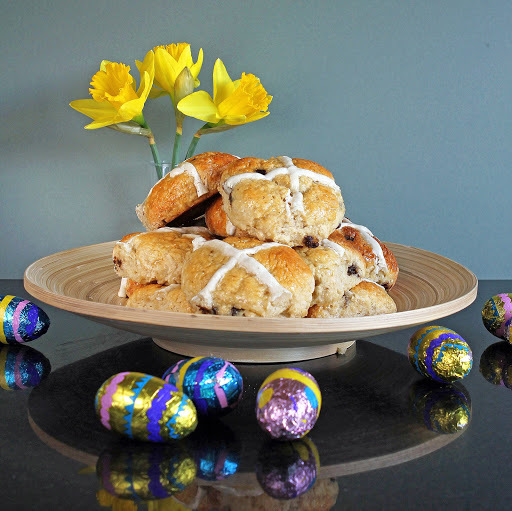 In sheer frustration, last year I managed to develop a fantastic Apple, Cherry & Sultana Hot Cross Bun recipe. We loved them..... gently spiced, fruity and most importantly soft and fluffy, they were a perfect Easter breakfast treat. This year, I have worked on a different recipe with a whole new base of ingredients....... and these buns are stuffed full of chocolate chips! It's taken a couple of goes to be happy with the recipe.... I wanted a bun which was not only robust and sticky, but also had the essential fluffiness alongside a slight density, with a bit of staying power on the freshness front. I'm pleased! These buns come extremely close to the gluten-based versions in both texture and flavour AND they meet both of my 'essential ways to eat' criteria..... incredibly moreish and perfectly delicious when eaten fresh, hot and steamy from the oven and also divine, crisply toasted (whether fresh or a few days old). They are also pretty good just sliced cold and sandwiched with butter, if that's how you prefer them. If you have too many to scoff, stick them in the freezer and defrost as you need them. The extra robustness and characteristic slight density of these buns comes from the use of psyllium husk..... a natural plant-fibre which (very helpfully) mimics some of the qualities of gluten. It is perfect for use in bread-type gluten free products and seems to create a more 'doughy' structure than xanthan gum alone. 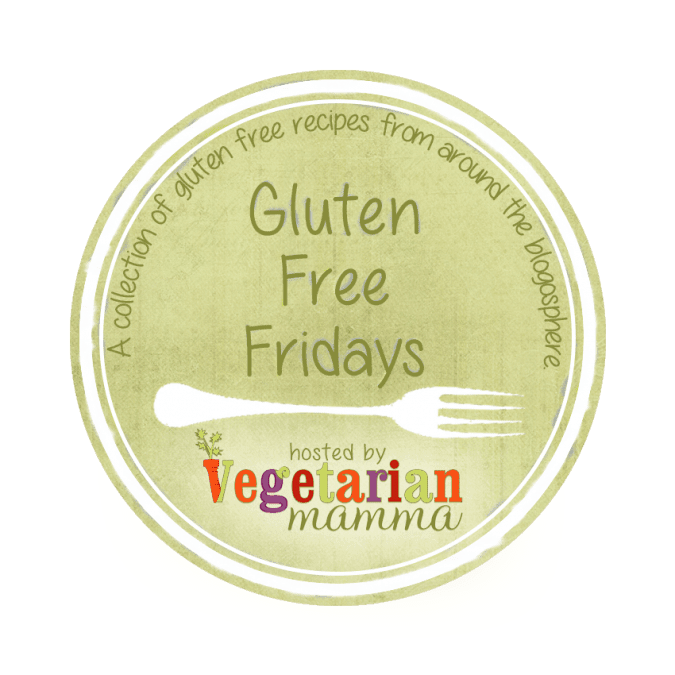 It isn't (in my view) a gluten-substitute that you would use in all bakes (being very gloopy and providing extra thickening), but in these buns, it works perfectly! I also added some ground almonds to the mix which (along with a dash of yoghurt) provides extra moistness and longevity to the freshness of the buns. If you cannot eat nuts, the buns are great without them - I've checked (see substitution below)...... the only difference being that they will lose their freshness a little quicker. I have a feeling this recipe will be incredibly versatile too..... If chocolate isn't your thing (she says bracing herself for the shock of an affirmative response), just add some seasonal spices and substitute the chocolate chips for whatever dried fruit or alternatives float your boat. If you do create a new flavour..... let me know about it. I love hearing what you've done with my creations! Tea Time Treats - with Janie over at The Hedge Combers and Lavender & Lovage. This month's theme celebrates Easter and Spring! The #FoodYearLinkup with Charlotte's Lively Kitchen. 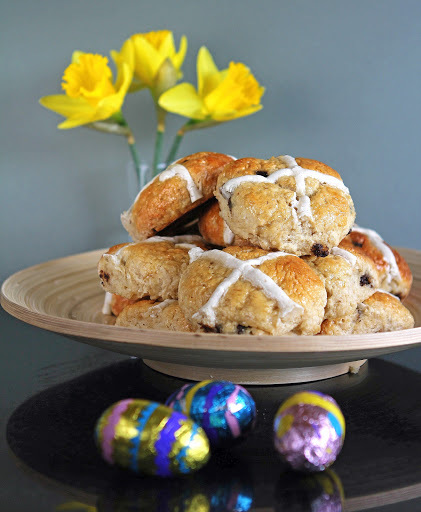 I am sharing my Choc Cross Buns as a foodie celebration of Easter and particularly Good Friday. We Should Cocoa - Being guest-hosted for March by Lancashire Food on behalf of Choclette at Tin & Thyme. This month, the chocolatey challenge invites recipes which include eggs. Cook Once Eat Twice with Searching for Spice. These Choc Cross Buns can be helpfully frozen and eaten later, but frozen or not, a batch will last for a few days. Simply Eggcellent - with Dom over at Belleau Kitchen. This month is an 'Anything Goes' month. That makes it eggstra easy to join-in! Alpha Bakes - This month with The More Than Occasional Baker (and Caroline Makes). 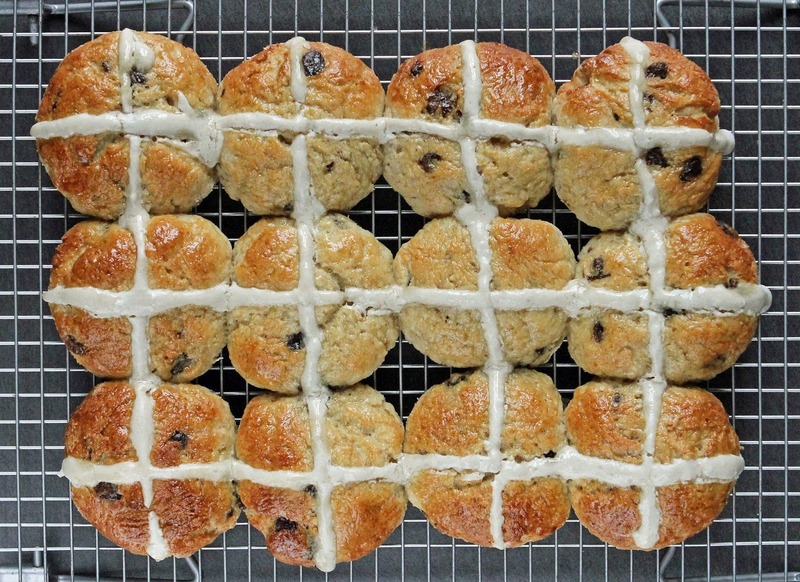 March's letter is a handy C...... That's perfect for Chocolate and in this case, Choc Cross Buns! Treat Petite with Kat, The Baking Explorer (and Cakeyboi). This month's theme is petite treats which say 'Easter & Spring'. In a medium-sized bowl, beat together (with a fork or non-electric hand-whisk) the psyllium husk, xanthan gum, eggs and hot water and set aside to thicken. In a separate bowl, whisk together the yeast, maple syrup, warm milk and yoghurt. Set aside in a warm place for about 10 minutes to activate the yeast (I put mine in a closed, very slightly warmed oven with a bowl of steaming water). In a large bowl, weigh and mix together the dry ingredients (almonds, flours, salt, sugar and baking powder), making sure any lumps are completely broken down. Melt the butter and mix with the vanilla extract in a small heat-proof bowl. Add the psyllium-egg mix, the activated yeast mix and the melted butter to the dry ingredients and fold together until just combined. Lastly add the chocolate chips and fold through. You should now have an even, sticky, thick dough. Tip the dough onto a well-floured surface and with floured hands, bring the dough together into a sausage shape. Cut the dough into 18 even pieces with a sharp knife and using lightly floured hands, mold/roll each piece into a ball shape. Place the balls on a baking tray (best lined with baking paper) with a slight gap between them. Cover the dough balls loosely with cling film and place in a warm place to rise for 50 to 60 minutes until almost doubled in size. Make the egg-wash by beating an egg with a little milk and brush over the buns to glaze before baking. 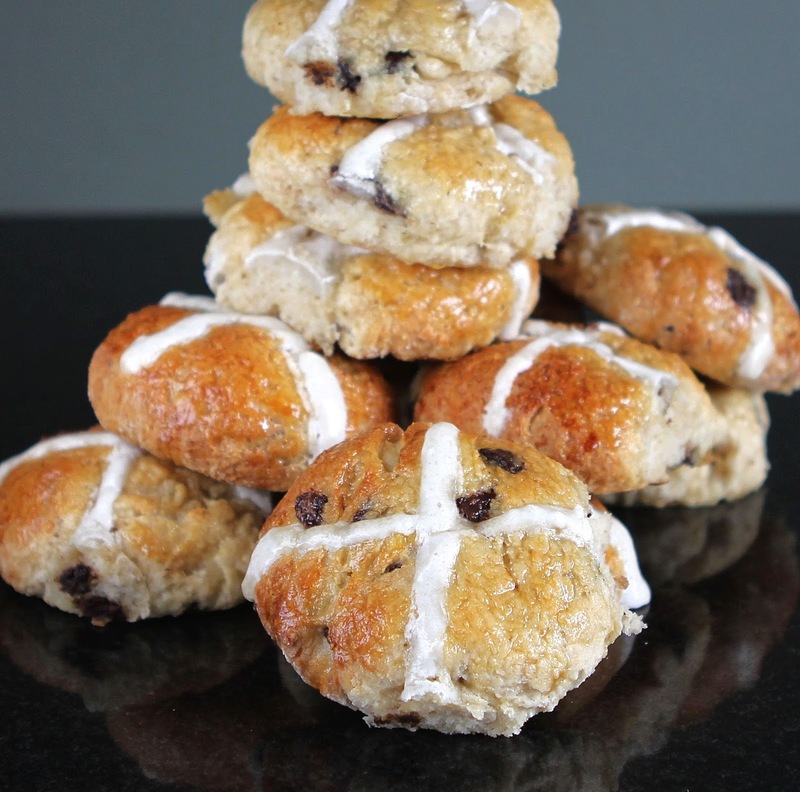 For the crosses : Blend together the flour, water and icing sugar until smooth. Use a piping bag fitted with a small round tip (I used one with a hole 5mm in diameter) and pipe crosses onto the buns. Place the buns in the oven and bake for 15 to 20 minutes until golden. Whilst they are baking, make the sugar glaze : Place the sugar and water into a small heat-proof bowl (for microwave) or saucepan (for hob) and warm together, stirring occasionally until the sugar is dissolved. Remove the buns from the oven and brush the top with sugar glaze whilst they are still hot. They sound delicious! We also like ours with cheese as a normal sandwich, even using them for cheese on toast. You're welcome Linzi. They are pretty good! 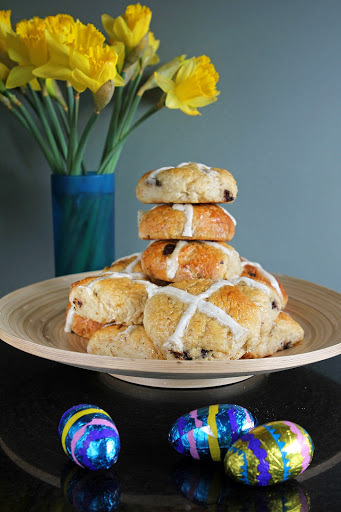 My husband is always asking for hot cross buns with chocolate in! I love dried fruit but he's not so keen so I know he'd love these. 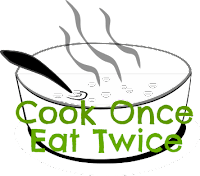 Thank you so much for joining in with #CookOnceEatTwice. Ha ha! Looks like you may just have to make chocolate ones! If your husband is anything like mine..... the way to keep him happy is definitely equated with his tum! Yum. I always thinks easter wins hands down over any other holiday in terms of food! Thank you. They taste lovely too Dom..... GF baking is still very much in its infancy, so there is always lots of room for improvement. These look amazing! 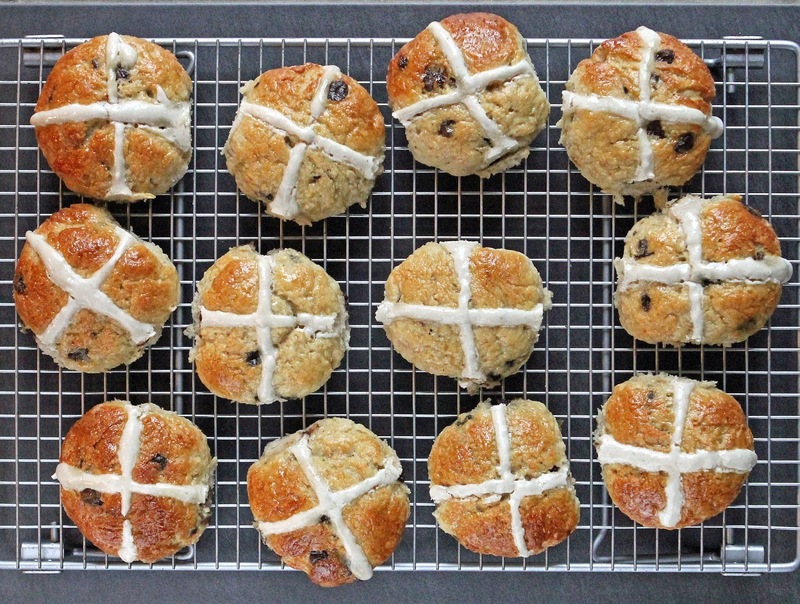 Hot Cross Buns are so good I would happily eat them all year round :) Thanks for entering into Treat Petite! Clever lady! These look fabulous! I have been meaning to get on with creating my gluten-free, dairy-free and fructose-free version but the flour is taking up rather a lot of my time. That and caring for poorly children which seems to be ongoing!!! Thanks Vicki. Hope the flour mission is making some progress and that the kids are all better..... Mine is now off sick too!! Thanks Angela. They don't taste GF either. I have made them with and without almonds now..... the almonds definitely make a difference! Well done! I love hot cross buns.I have a few friends who are gluten intollerant and I am going to pass on this recipe. They look so perfectly made! Thanks Kathy. You're welcome. Let me know how you get on! I'm always astounded at your GF knowledge and this is yet another example. This recipes sounds really yummy, I love the addition of chocolate chips, I'm pretty sure everything can be improved with just a little added chocolate! Awww... thank you Charlotte.... I learn by hit and miss..... I really should get more scientific, but that might stifle my enthusiasm! 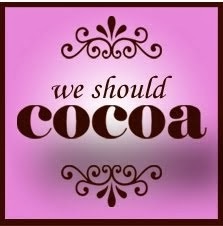 I do agree though that everything can be improved with a little chocolate! Oh goodness Kate. These sound fabulous and I heartily approve of the chocolate of course. 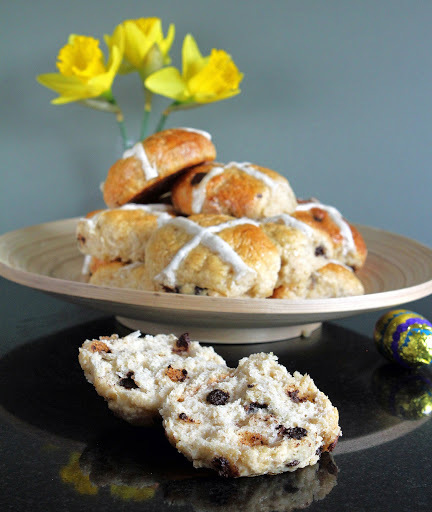 I do love a good homemade hot cross bun and have been sadly remiss this year and not made any. I remember CT being prescribed psyllium husk by a herbalist a few years ago and we had a massive bag of it. Hadn't really thought about it being used in baking, but I can see how it might work. Thanks for sharing these with We Should Cocoa and Happy Easter to you all. Thanks Choclette. The psyllium has some amazing properties and I can see that now discovered, it could become more frequently used in my baking..... for bread especially. The buns went down extremely well with guests of ours over Easter! I hope you had a peaceful Easter and enjoyed plenty of wonderful foodie delights! 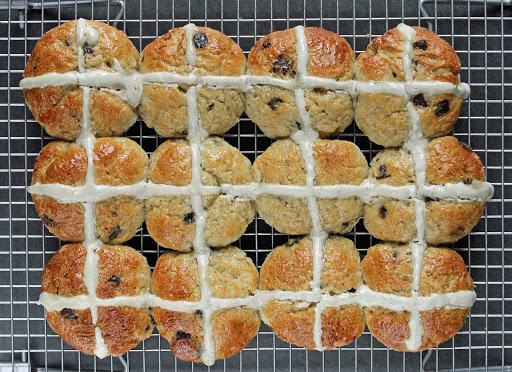 Well done on creating your own gluten free variation of a hot cross buns. They look delicious and I love the chocolate flavour which of course appeals to the choc-a-holic in me! Thanks for entering AlphaBakes. Thanks Ros. These were a real success and I was so pleased with the texture. I've tested them on a bunch of people now and they all loved them, so I am pretty happy that this recipe is a keeper. Love these, going to pin on my GF board for next year! Thanks so much for sharing with Tea Time Treats :) A belated round up is on its way!